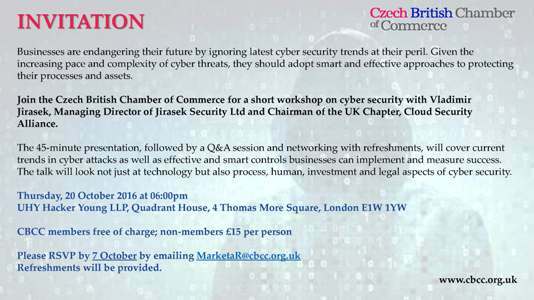 The Czech British Chamber of Commerce is proud to be hosting a presentation on the topic of cyber security on 20 October 2016. Businesses are endangering their future by ignoring latest cyber security trends at their peril. Given the increasing pace and complexity of cyber threats, they should adopt smart and effective approaches to protecting their processes and assets. Join us for a short workshop on cyber security with Vladimir Jirasek, Managing Director of Jirasek Security Ltd and Chairman of the UK Chapter, Cloud Security Alliance. The 45-minute presentation, followed by a Q&A session and networking with refreshments, will cover current trends in cyber attacks as well as effective and smart controls businesses can implement and measure success. The talk will look not just at technology but also process, human, investment and legal aspects of cyber security.